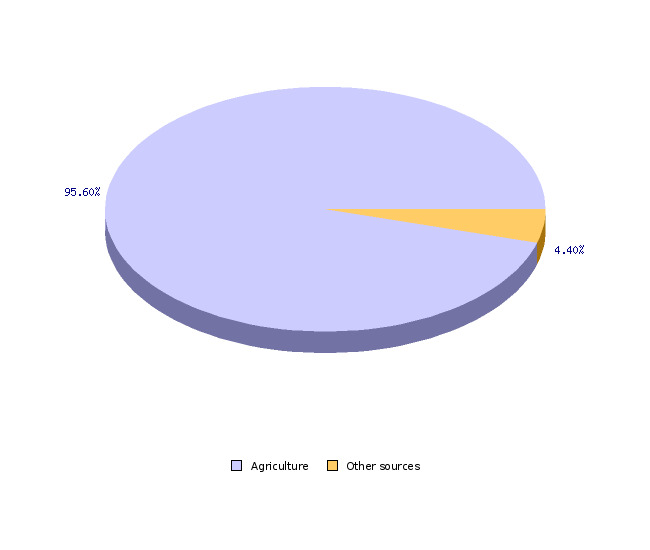 In 2005, agriculture contributed 94.9% of total ammonia emissions in Slovenia. According to the data for 2002, ammonia emissions per hectare of utilised agricultural area (37.4 kg per year) are considerably above the EU-15 average (21.7 kg per year). Between 1990 and 2005, ammonia emissions in Slovenia were reduced by 12.9%. In the last few years, ammonia emissions in Slovenia have been just below the limit defined by the adopted international obligations (20,000 tons per year). The indicator presents the ammonia emissions in agriculture. The main emission sources and changes in emissions between 1990 and 2005 are shown in total and by individual sources. 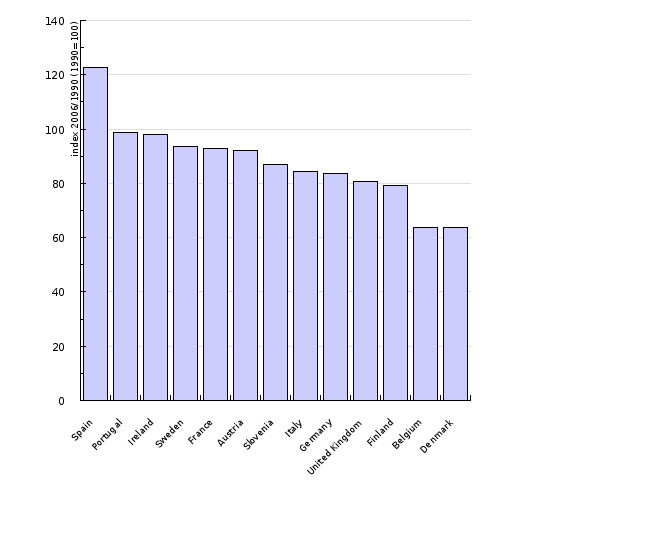 Emissions per hectare of agricultural land in comparison with other European countries are also presented. Ammonia causes a lot of damage to people’s health, environment and agriculture. Its salts are transported to long distances, forming small particles which cause respiratory diseases. It also contributes to the formation of acid rain and causes soil acidification. With ammonia, nitrogen is deposited into natural ecosystems, causing their changes. In large concentrations, ammonia has a direct harmful effect on the health and well-being of people and animals, and a direct poisonous effect on plants. And last but not least, with ammonia, we are losing nitrogen in the air, which is a valuable nutrient. Agricultural Institute of the Republic of Slovenia, 2008; Environmental Agency of the Republic of Slovenia, 2008. Agricultural Institute of the Republic of Slovenia, 2008. Agricultural Institute of the Republic of Slovenia, 2008; European Environment Agency, 2008. The Protocol to Abate Acidification, Eutrophication and Ground-level Ozone (Gothenburg Protocol to the Convention on Long Range Transboundary Air Pollution) set the goals regarding ammonia emissions. Slovenia signed it in December 1999 and ratified it in April 2004. Slovenia’s obligations to the Gothenburg Protocol are defined in the Directive on National Emission Ceilings for Atmospheric Pollutants (2001/81/ES), also called the NEC Directive. According to this directive, Slovenia is not allowed to increase ammonia emissions above 20,000 tons per year. Agriculture contributes a great majority of all atmospheric ammonia emissions. The most ammonia is released in fertilization with livestock manure, followed by emissions from animal houses and due to grazing, emissions from livestock manure storage and emissions due to fertilization with mineral fertilizers. One of the reasons for major emissions in fertilization is the lack of machinery for banded application or incorporation of slurry into soil. Emissions during soil fertilization using this machinery are considerably lower than during the common method of spraying the slurry. Of all types of farming, cattle production, including emissions from application of cattle manures, contributes the most ammonia (59.9 %), followed by pig production with 19.3 %. Between 1990 and 2005, annual emissions of ammonia in agriculture were reduced from 19,901 tons to 17,342 tons or by 12.9 %. Reduction in Slovenia is similar to the reduction in the EU-15 countries. In cattle production as the most important individual source, emissions from houses and grazed animals have slightly increased, and emissions during manure storage and fertilizing with it have decreased. The decrease is attributed to the significant reduction in the size of the herd. A slight increase in the emissions from animal housing is attributed to the increase in the share of loose rearing system, where emissions are higher than in traditional tied rearing systems with separate collection of manure and slurry. The increase in the intensity of rearing contributed to the fact that the decrease in the emissions did not entirely follow the decrease in the size of the herd. Intensive rearing increases nitrogen excretion, which results in higher emissions of ammonia. In absolute terms, poultry production contributed the most to the decrease in emissions by more than halving the flock in the studied period. A large relative increase in the emissions from horses and small ruminants is irrelevant in absolute terms, since these emissions, in spite of the increase, do not represent more than 3.5 % of all emissions in agriculture. Annual emissions of ammonia per hectare of utilised agricultural area in Slovenia are well above the EU-15 average. This is due to the large share of grassland and consequently well developed livestock production. On the national level, in the countries with well developed arable farming, the emissions of ammonia from livestock production are distributed to the arable areas with a relatively low number of livestock. High emissions are also the consequence of the prevailing barn rearing of livestock, where emissions are much higher than in free-range production systems. Individual regulations intended for the protection of waters also contribute to the reduction of ammonia emissions, for example the Decree on the Limit Input of Concentration Values of Dangerous Substances and Fertilizers in Soil, which defines the highest permissible stocking density on agricultural land. Agricultural environmental measures implemented in the framework of the Rural Development Programme further contribute to the reduction of emissions. Stricter measures for stocking density on agricultural land than those regulated by the legislation apply to the recipients of payments stemming from the agricultural environmental measures. Agricultural Institute of the Republic of Slovenia. 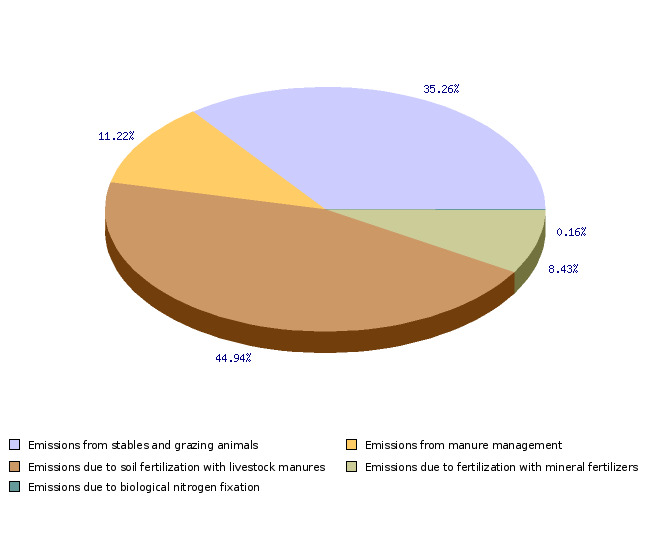 Estimates on atmospheric emissions of ammonia in agriculture were produced on the basis of the EMEP/CORINAIR (2002) methodology, taking into account the specificities of Slovenian agriculture. Estimates were based on the data on the extent of livestock breeding, consumption of mineral fertilizers and extent of legume crops production, Statistical Office of the Republic of Slovenia (SURS). In determining emission factors, numerous expert estimates on animal feeding, methods of housing animals, methods of collecting and storing livestock manure and fertilization practices with livestock manure were taken into consideration. For the estimates of nitrogen excretion in dairy cows, production intensity was considered as well. This methodology is comparable with the method used in the majority of the European countries. 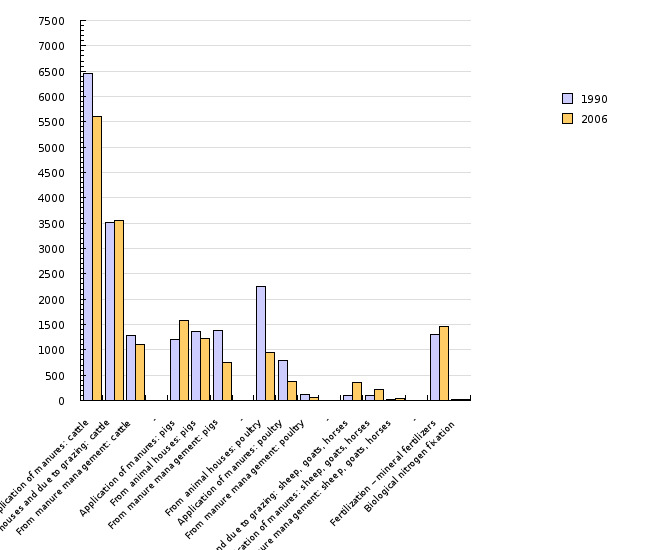 In the past, Slovenia used a slightly less detailed method for reporting to the Convention on Long-Range Transboundary Air Pollution, which gave similar results. IRENA Indicator Fact Sheet, Atmospheric emissions of ammonia from agriculture, European Environment Agency, 2005. Data presented for Europe were communicated to the Convention on Long-Range Transboundary Air Pollution by the member countries. In Europe, the methodology for the estimation of ammonia emissions has not yet been fully uniformed. The differences, however, are not big enough to bring data comparability into question.